The South Caribbean side of Costa Rica is known for its laid-back bungalow resorts. Azania Bungalows are just outside of Puerto Viejo, on the road to Manzanillo. Situated in front of Cocles Beach, a beautiful place. Awarded with the Costa Rican Government the Blue Flag for cleanliness. They offer perfect accommodations for a chilled out beach holiday on the Caribbean sea. 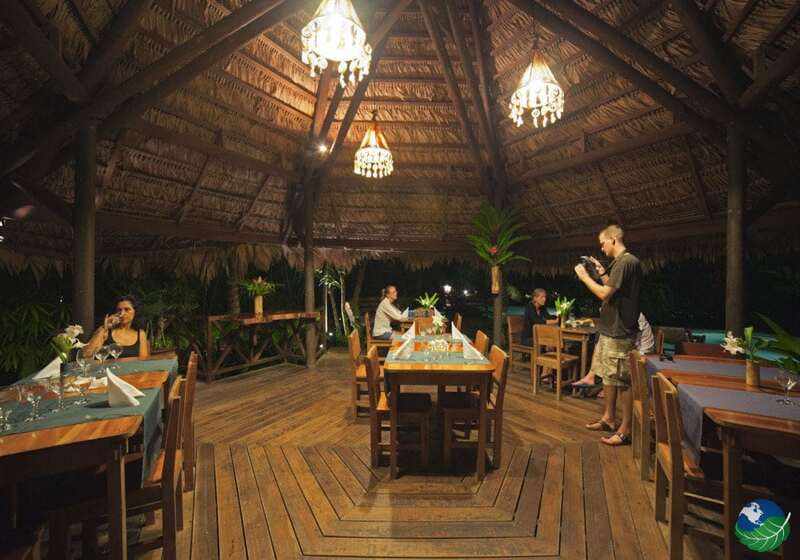 It is the perfect place for enjoying ‘island life’ in Costa Rica. Hire a bicycle and explore the local surroundings or go further afield and check out the Cahuita National Park. Also, the Manzanillo Wildlife Refuge. 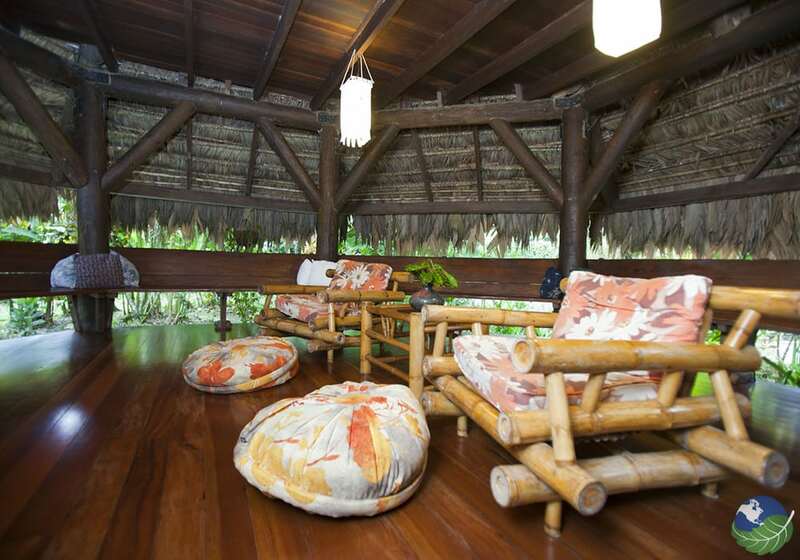 Each bungalow in Azania Bungalows boasts its private deck and hammock. 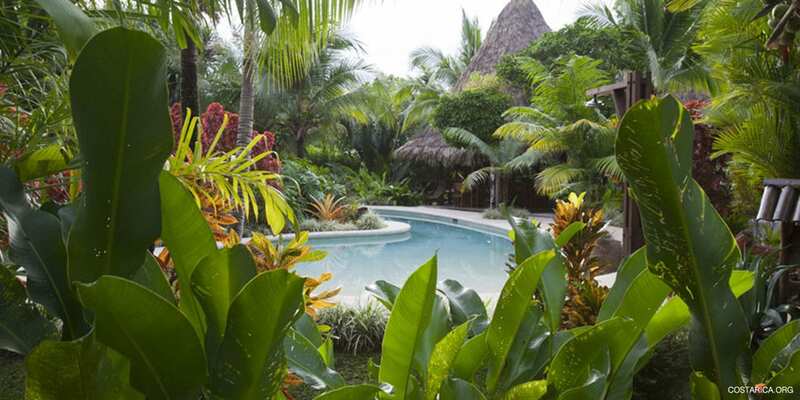 The perfect place to relax and enjoy the hotel’s surroundings filled with pretty flowers and tropical fruit trees. The exotic, colorful gardens are abundant with a huge variety of birds and butterflies. Inside, you will find a mini bar, mosquito nets, a safety box and wifi access. After a long day, enjoy the beautiful sauna-style bathrooms designed to bring the feeling of at being one with nature indoors. 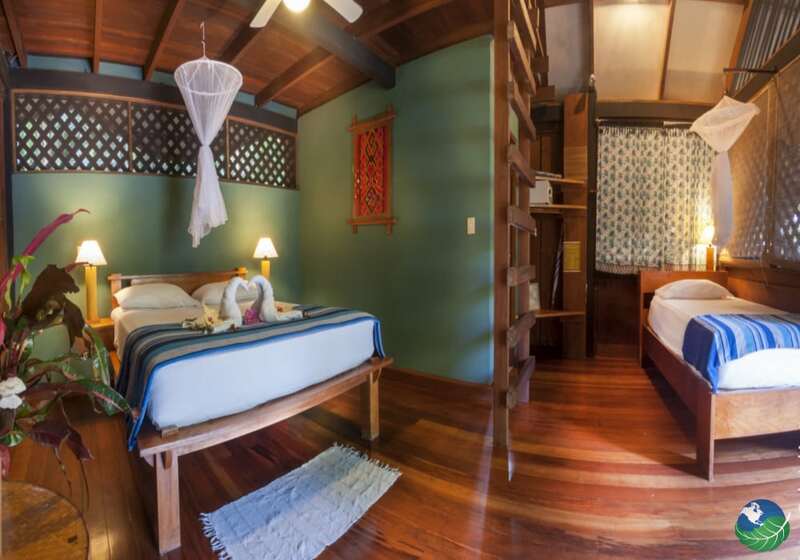 The decor follows the same design, with thatched rooves, bamboo furniture and exotic woods making up each cabin. Lodging up to four people, the Azania Bungalows host many people comfortably. 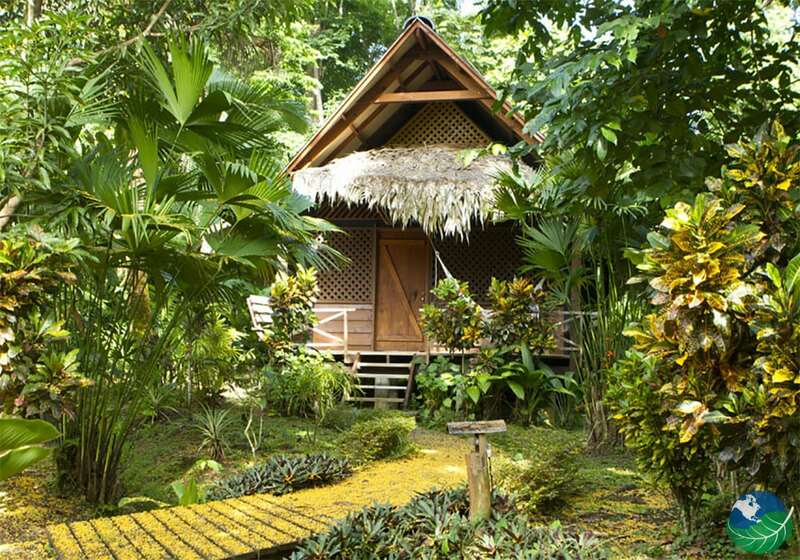 In fact, the lush tropical gardens are not the only outdoor beauty that Azania Bungalows offers. There is also a free-form pool and jacuzzi. Perfect for those lazy days lying in the sun. Or for an early morning swim to get you ready for the day’s adventures. 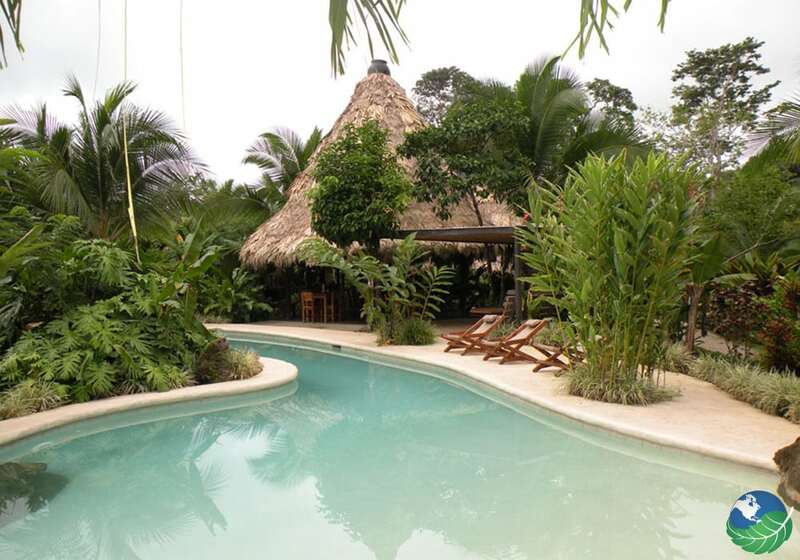 At the side of the pool, is a ‘Quincho’-style Rancho that provides cocktails and a lunch menu for those not wishing to move far from their sunbeds. 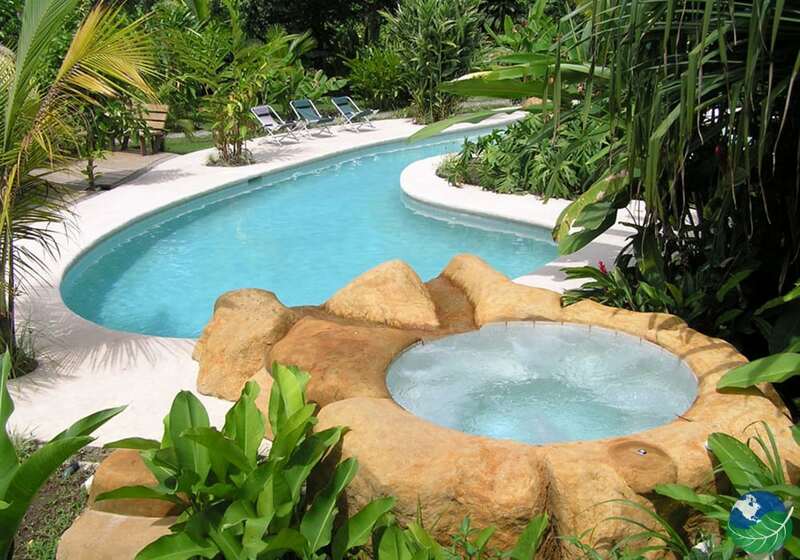 The jacuzzi is connected to the pool by a sculpted waterfall creating the relaxing sound of running water to add to the sounds of the jungle as you relax in the sunshine. The Clubhouse Rancho area of the Azania Bungalows is perfect for anything from enjoying a delicious light breakfast to watching television or playing games. It also happens to be the reception area so that you can find out about all of the latest tours, activities and other services, such as car and bike rental. Here you can sit and enjoy a cocktail before heading to the hotel restaurant which offers some amazing grilled specialty dishes, all made with fresh, local produce. And don’t forget to sample the wine menu, which boasts many excellent Argentinian wines. It is the perfect place to relax before heading back to your cozy cabin.